Dressage legend Carl Hester has joined the ranks of riders supporting Wallace The Great’s bid for dressage glory. The multiple Olympic medallist praises British Dressage (BD) for allowing mule Wallace, who was initially barred from being registered, to compete, in his column in today’s (12 July) H&H magazine. 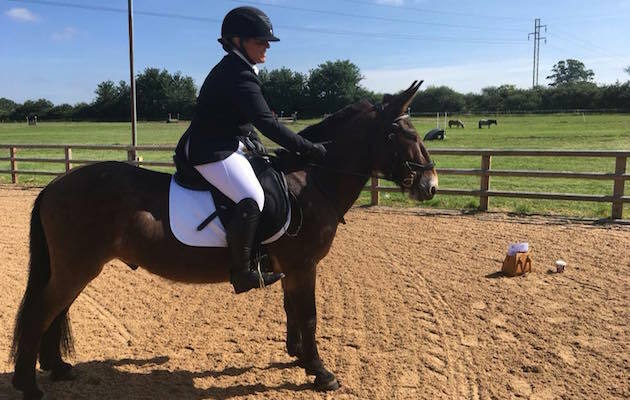 “Well done to the BD board for its quick decision to realign the rules and allow Wallace the mule to compete in the Team Quest classes his rider is aiming for,” he wrote. “Once again, however, I am totally lost for words at some of the horrible comments on social media. At the end of the day, BD was following rules and should not be subjected to attacks that are totally out of order, and often personal. H&H reported last month that rider Christie Mclean had applied for club membership for Wallace, who was found roaming the streets of Ireland and brought to England by the Donkey Sanctuary, but was refused. BD said that in line with FEI rules, mules were not allowed to compete. It then emerged that FEI rules do cover the donkey-horse crosses, so BD changed its policy to allow Wallace, and his long-eared colleagues, up the centre line. The story was picked up by local and national press and Wallace became a media sensation. “Wallace has become a celebrity in the process,” said Carl, adding that he was “amazed” to see the story in the Daily Mail. “Let’s hope that the Daily Mail now follows up with a more positive conclusion,” he wrote. At least one other mule has also been registered since Wallace was accepted: Fergus II has also joined BD ranks. For more on Wallace, and Carl’s column, see H&H magazine, out today.